Hi everyone! 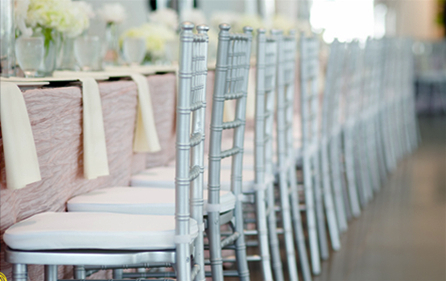 The UW Wedding and Special Events Fair is coming up in just over a week – next Sunday, June 30! If you’ve never had a chance to visit the UW campus during the summer you’re missing out, my friend. 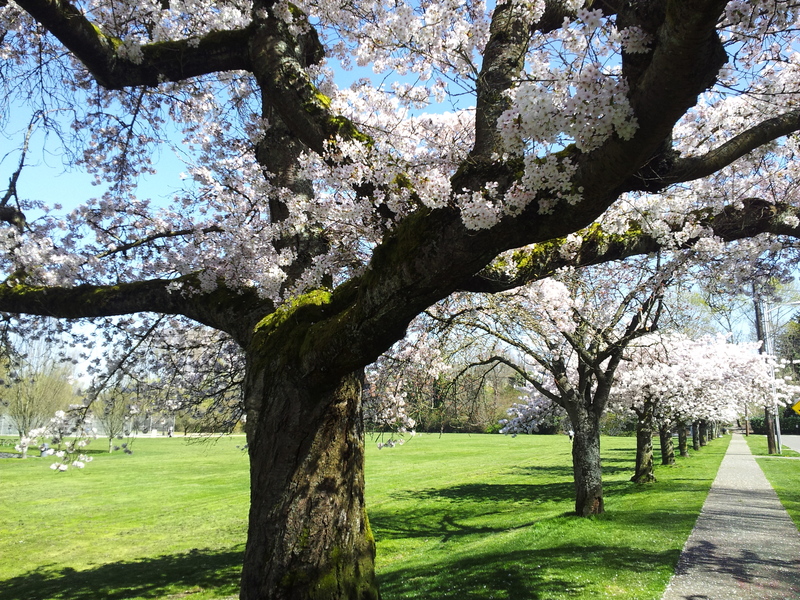 The cherry blossoms in the quad are magnificent! If you’re in the beginning stages of planning your special event or just have next Sunday open from 1pm-3pm and want something to do, I highly suggest coming to this event. Various Seattle vendors will be on hand to wow you with their services. Not to mention, award-winning chef Jon Maley will be serving up complimentary appetizers and beverages. As if you needed another reason to attend, at just $5 to get in, it’s the cheapest ticket in town! And it’s even cheaper for some of you out there – dare I say it’s free for certain people (check the UW events website for more information). You do need a ticket to enter so be sure to RSVP. And hopefully it goes without saying, but I’m obviously going to say it anyway – stop by the Seattle’s Best Chair Covers table and say HI to me! With June just around the corner, the official start of the wedding season is upon us! Yay – we’re so excited! The weather this spring in Seattle has been a bit crazy though – lots of windy days. No doubt the summer will prove to be as beautiful as it usually is making the city a beautiful backdrop for some gorgeous weddings. 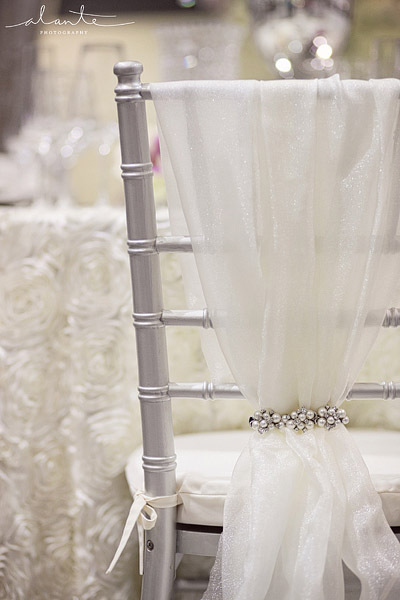 Above is one of my favorite photos from a wedding we did chair covers and sashes for last summer. Salty’s on Alki always makes for a wonderful venue – especially when the sun is out and shining it’s beautiful warm rays on us. 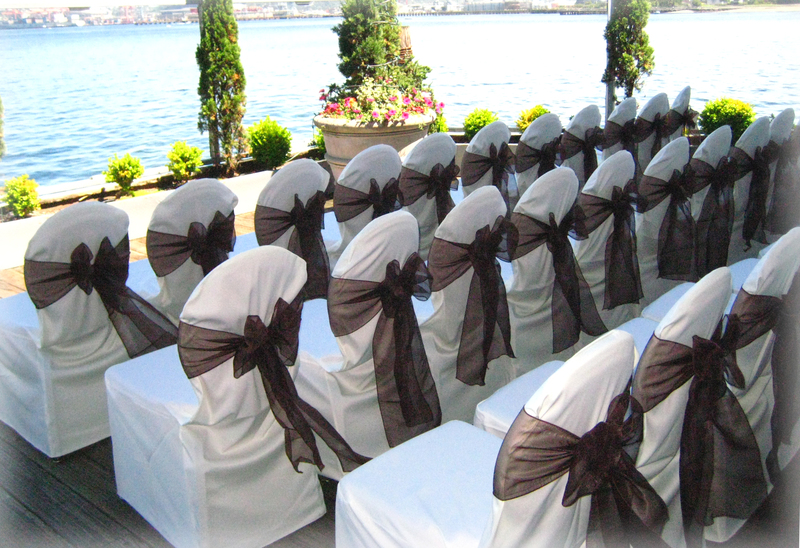 The couple renting our covers and sashes for this wedding choose a wonderful espresso color sash – so elegant. 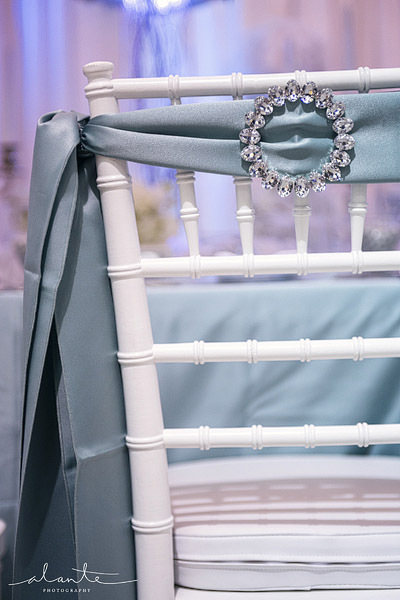 This season, we’re seeing a lot of brides and grooms pick traditional and royal colors such as dark blue, silver and white. I can’t wait to update you on what other trends we’re seeing. But first, we’ll explore a traditional wedding in Thailand. I recently returned from attending my sister’s wedding there and let me just give you a preview by saying – AMAZING! So check back soon and we’ll talk Thai wedding customs.